As Cory Booker made his announcement on Friday that he would be running for president, NJTechWeekly.com couldn’t help but look back at some of our interactions with Booker, who championed the fledgling tech startup ecosystem in Newark early on. Frankly, we believe that Booker has supported New Jersey tech, especially startups in the state, at every turn. Please leave comments if you disagree. 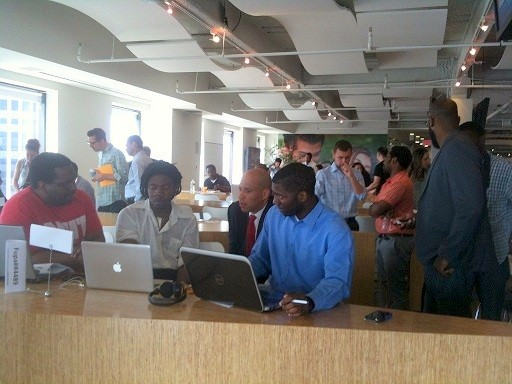 Our evidence: Booker, who has always been known for his upbeat political messages, gave rousing talks to small groups of developers who showed up for events such as a hackathon to jumpstart the City of Newark’s website in June 2013 (see below). He spent time talking to and encouraging each and every team in the building, posing for photos with them, and expressing genuine interest in their work. 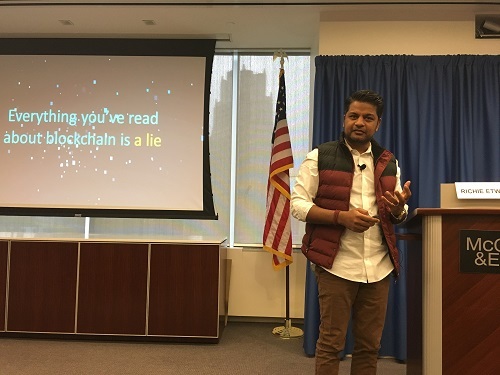 He showed up, if not in person, then by virtual address, at many important tech events in New Jersey, including Propelify in Hoboken. He supported Newark Venture Partners. He championed science and technology in Newark schools. 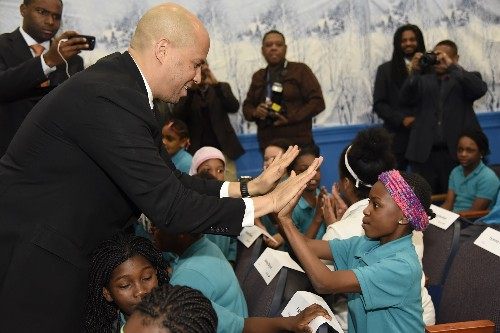 In May 2018, Booker participated in the opening of a 10,000-square-foot STEM center at Newark Public Schools headquarters. He was also part of the team that helped put Newark on the short list for Amazon HQ2. Booker, who also became a startup founder himself, took some criticism for his ties to a social media website called “Waywire,” with a stake of more than $1 million, highlighting his involvement with tech moguls and entrepreneurs, according to an article published in The New York Times. Waywire didn’t make it, but Booker never lost his entrepreneurial spirit. “Newark, a city transitioning to an aspiring tech Hub, celebrated Newark Tech Week — a full four days of tech-themed events capped off by a minority-focused hackathon at the Rutgers Business School on April 6 and April 7, 2013. “Washington, D.C.-based Blerdology — a name that evokes the science of self-described “black nerds” — organized the hackathon, called #blackhack Newark, which featured entrepreneurs, programmers, experts and a visit from Newark Mayor Cory Booker. “Mayor Booker’s attendance at the event was notable, an acknowledgment that Newark’s growing tech ecosystem is coalescing. “More than 50 people attended the two-day hack, with over 20 of them participating. Nearly half the participants were Rutgers students. They divided into four teams and worked on projects including the brand notification app Loud Whisper and a crowdfunding platform for philanthropists called Capital Cause. “In addition to Rutgers Business School (specifically, the Center for Urban Entrepreneurship & Economic Development), Blerdology partnered with MailChimp, Brick City Development Corp. (BCDC), Newark consultants Medina Citi and Washington energy efficiency firm Opower to organize the hack. 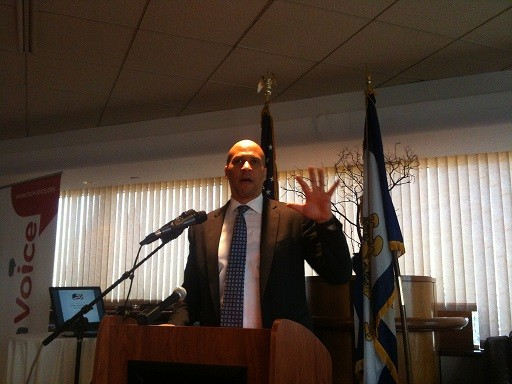 In 2013, we also covered then Newark Mayor Cory Booker’s discussion of technology at a breakfast meeting on May 5, hosted by the newly formed tri-state chapter of the technology industry lobbying organization TechVoice. The following is from our story Booker Talks Newark’s Dark Fiber, Startups and Gov. 2.0 at TechVoice Breakfast. 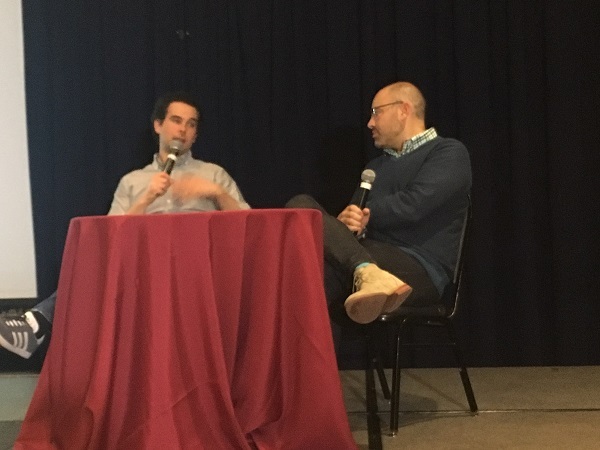 “Booker was introduced as both a mayor and a tech entrepreneur — he is a founder of Waywire, a N.Y.-based startup that focuses on online video curation. “While his remarks touched only briefly on the goal of the meeting — to have small and midlevel tri-state tech companies’ voices heard in Washington on topics like immigration reform — Mayor Booker did speak about how to make Newark attractive to tech companies and how government initiatives using big data are transforming cities like his. “Booker said he had asked startup leaders in Silicon Valley why they are there or aren’t in N.J., the ‘innovation state.’ He was told they liked the proliferation of bars, restaurants, galleries, sports teams and concert opportunities in Silicon Valley. “Newark, and New Jersey in general, Booker said, are becoming places that can attract tech entrepreneurs. ‘We have the raw material here, from great universities to an incredibly educated population. We have to focus on the cities where we have the infrastructure,’ he added. “Said the mayor, ‘My team is in awe of the dark fiber running right through Newark … we are becoming the fastest city as far as giving innovators and entrepreneurs … high-speed connectivity. “‘We believe that by having universities here like NJIT [New Jersey Institute of Technology] and Rutgers, we are going to be able to connect people with sources for the brightest minds in the globe who are coming here to study,’ he proclaimed. 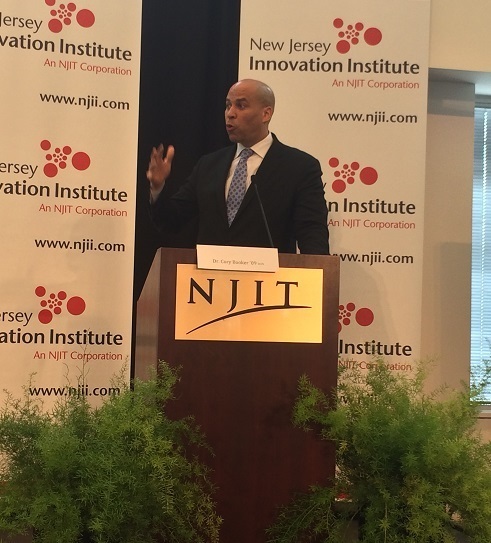 “Booker said he believes the city has already shown it has a focus on tech innovation through spaces like the NJIT Enterprise Development Center (EDC), which is dedicated to nurturing tech startups, and ‘we want to expand that,’ he said. “‘This is the first time in 60 years that Newark’s population is growing, the first time in decades our tax base is surging, the biggest redevelopment time in Newark since the 1950s,’ he asserted, adding that the Brick City is becoming a ‘great place’ for tech entrepreneurs to live. “Booker explained that when Newark builds market-based housing, many residents who buy are ‘net’ new residents of the state. He added that New Yorkers have told him they can go to a hip place [in Newark] with restaurants, sports events, galleries and concerts and ‘can also buy a house for the cost of a doorknob in New York City. And if I need to go into New York [for business, a concert, a show or dinner], I can beat my friends who live on the Upper East Side.’ He said he believes Newark has the competitive advantage due to its position as a transportation hub. “The mayor had high praise for the open-government and Gov. 2.0 accomplishments of mayors Mike Bloomberg of New York, Thomas Menino of Boston and Edwin Lee of San Francisco, saying his counterparts are helping tech make government more efficient and open. Mayor Bloomberg, noted Booker, has pulled together other mayors to share ideas. ‘He is saying that mayors can be innovators!’ he declared. “About 10 teams competed for the $30,000 opportunity to turn the city’s website into a more open one that will incorporate social media and feedback, and connect users to not only Newark’s services but its businesses. “The Small Business Tech and Social Innovation Forum, held at Stevens Institute of Technology (Hoboken) July 11, 2014, brought together the representatives of many major social networks. Also in attendance were New Jersey businesses that had succeeded at social networking, and professionals working in social media marketing. “Sen. Cory Booker, New Jersey’s most famous social media user, hosted the forum, discussing his experiences advancing Newark through the Web. 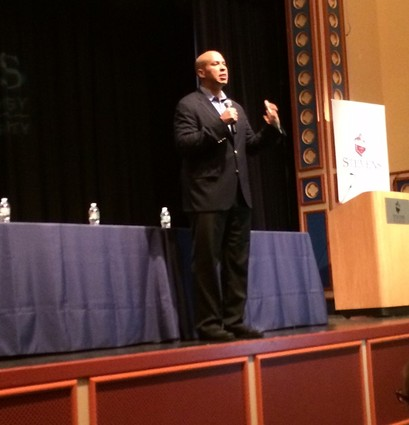 “Booker always delivers a good talk, and that day he regaled the audience with the story of how, when he was mayor of Newark, he had responded to a Conan O’Brien joke about that city. Booker explained that after thinking about it, he made a video extolling Newark’s virtues and banning O’Brien from Newark Airport. ‘Just a few years ago, the best you could do was write a letter” of protest that ‘would be read by an intern’s intern,’ he pointed out. “The video went viral and elicited many objections from those who apparently couldn’t take a joke, including the Transportation Security Administration, which stated that a mayor can’t ban anyone from an airport in his district. 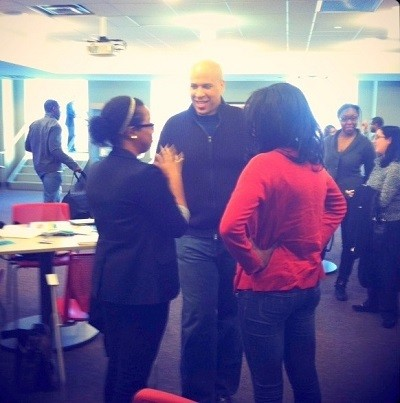 In 2014, Booker came to Tigerlabs in Princeton for a pitch event. Our reporter Steven Galante covered it here: “Startup Senator” Booker Judges Pitch-Off at Tigerlabs in Princeton. “On Tuesday, Sept. 24, U.S. 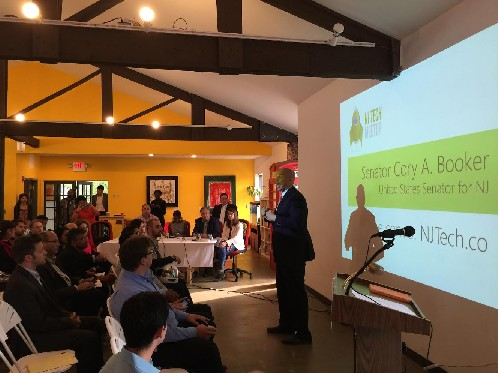 Senator Cory Booker was the featured judge at the NJ Tech Meetup/TechLaunch pitch event at Tigerlabs, in Princeton, N.J., listening to presentations and offering advice to the contestants and the nearly 100 people in attendance. 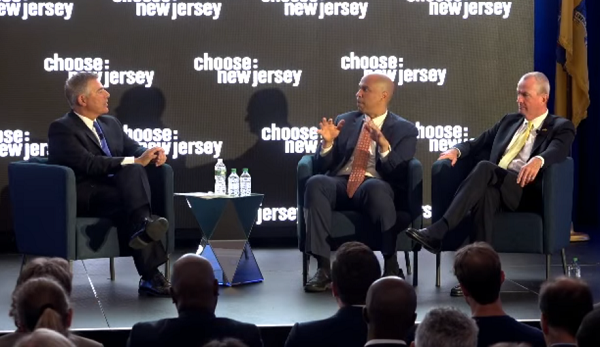 “As a member of the Committee on Commerce, Science, and Transportation and the Committee on Small Business and Entrepreneurship, Booker said he had a keen interest in seeing what kinds of businesses are emerging in New Jersey and in understanding what he can do as a legislator to support their growth. “‘The power in America for job creation and business growth is to support small businesses. And as I look at small businesses I notice the tech and innovation sector is really one of the boom areas for our country,’ Booker said. In our story Newark Elementary School Gets $50,000 Grant from Samsung for Technology and Visit from Booker, we covered Booker’s visit with fourth- and fifth-grade girls participating in a Samsung-financed programming/engineering program at Peshine Avenue School, in Newark. “‘STEM programs are critically important to the future of country,’ he said. Booker then rattled off statistics about the lack of females — and minority females in particular — in science and technology careers. “Using [Dr. David] Steel’s [Samsung executive vice president] Samsung smart watch as an affirmation of his point, Booker explained how the work the students at Peshine Avenue Elementary were doing could impact the innovations of the future. ‘That watch is the result of thousands of hours of work, thousands of hours of people putting something together,’ he said, citing machinists working on metal as just one example of the work that was instrumental in the manufacture of the watch. “‘This is science in action,’ said Steel, showing off the square on his wrist, which can take pictures, record audio and video, and notify the user of incoming emails. In our opinion piece in mid-July 2018, we discussed how Booker had become a champion for new legislation that was part of the Republican tax reform bill passed into law. “On July 16, Booker and Gov. Phil Murphy participated in a round table discussion moderated by Steve Adubato and sponsored by Choose New Jersey. “The discussion focused on ‘Opportunity Zones,’ areas enabled by the 2017 Tax Cuts and Jobs Act. Governor Murphy quickly jumped on the chance for economic development in New Jersey and submitted 169 areas within 75 towns and municipalities for approval. They were approved by the Federal government. “Booker, a Democrat, and Tim Scott, a Republican, were instrumental in writing and getting this bipartisan piece of the tax act passed. Most New Jersey observers believe that most of the tax reform package negatively impacts New Jersey. The Opportunity Zone piece is a silver lining. “Murphy and his team, while selecting which tracts to put forward, looked for areas that had the potential to be transportation hubs. Thus, in New Jersey, they will be places where people can get to work and if residential, places where residents can easily leave to commute.